Hidalgo County Operations Administrator J. Chris Trevino accepts a Texas Association of Counties Best Practices Award from Rick Avery, TAC county relations officer, for the Executive Office - Nuisance Abatement Program. The award marks the second time Treviño receives the award. Behind him from left to right: Hidalgo county commissioners Joe Flores, Eddie Cantu, David Fuentes and Hidalgo County Executive Officer Valde Guerra. 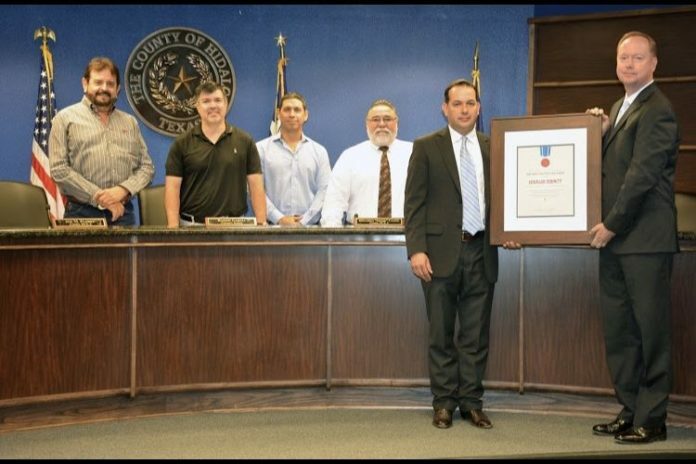 EDINBURG — Hidalgo County once again received a prestigious County Best Practice Award from the leading organization for county government in the state. Every two years, the Texas Association of Counties recognizes efforts to create “new, efficient and effective solutions” to the challenges local governments face, and this year, the organization selected Hidalgo County’s nuisance abatement program, which aims to create cleaner and safer environments in rural areas. Hidalgo County Operations Administrator J. Chris Treviño, who created and oversees the program, accepted the award from TAC earlier this week, marking the second time his initiatives have been recognized by the association. In 2016, the organization gave Hidalgo County a Best Practice Award for its vehicular GPS program, which tracks county-owned vehicles and has led to a savings of more than $25,000 in fuel costs since its inception. Treviño, who’s been working for the county in multiple capacities since he was first hired as a part-time filing clerk in 1998, is the only non-elected official who has ever received the award in the history of Hidalgo County. Past winners include former Hidalgo County Judge J.D. Salinas, former Precinct 2 Commissioner Hector “Tito” Palacios, County Clerk Arturo Guajardo and Treviño’s father, former County Sheriff Guadalupe “Lupe” Treviño, who won the award twice. “I’ve had a lot of good mentors in front of me,” said Treviño, who holds a master’s in public administration and is a state-certified public manager. Since the program’s inception in October 2016, residents have reported 1,732 cases of potential health and safety code violations. Of the more than 1,700 reported cases, Hidalgo County has only been forced to step in and improve 140 private properties, but that only occurs only after a lengthy process between the county, the respective precinct and the property owners. Still, the program would not be viable without the help of rural residents, who report the violations that range between weedy lots, unsanitary conditions, visual obstructions to county property and failing to maintain drainage easements to their respective precincts. Its success has also be noted by an incoming commissioner from Hood County that read about the program on TAC’s website and reached out to Treviño.